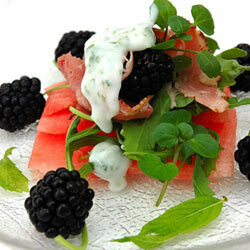 Cut the watermelon into wafer-thin slices and arrange on individual plates. I used about 4 slices per person. Pile high with the rocket or watercress and place the pastrami in a wave-like fashion on the top. Make a dressing with the mayonnaise, yogurt and freshly chopped mint and drizzle over the top. Scatter some blackberries on the plate and serve immediately.